After finishing studying in South Africa in 2000 I worked there for a year then came over to the UK to work & travel as much as possible. I have now been in the UK for 15 years, spending most of the time working at charity hospitals. 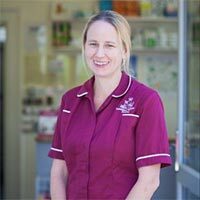 I started at Twickenham Veterinary Surgery as a locum after a break to have our first child then promptly had our second & am now back part time covering a colleague’s maternity leave. I find it rewarding seeing pets go home after treatment or surgery & enjoy getting to know our older patients through nurse clinics.